Update: Still no response from the Emanuel Administration---specifically, the Chicago Department of Water Management and the Chicago Department of Transportation---regarding why our local streets (specifically, 63rd Street and Archer Avenue) have been torn up and gone so long with no prompt repaving. Three times, a Water Management spokesman has pledged to get us a straight answer (most recently on August 2). Over a week later, still nothing. So what do we infer from that? Either the Emanuel Administration is inept or lying---flipping the bird---again---to voters and taxpayers on the Southwest Side. Remember that this November, folks, when Emanuel asks you to vote for various political candidates. That said, the stretch of Archer that has been scarred with rough-surface concrete for weeks on end (westbound lanes between Newland and Neva), finally got re-paved on Friday by a contractor hired by Peoples Gas. Update on "Rough Roads, Slow and Shoddy Repaving, and Excuses"
Looks like what Emanuel said at his inaugural: "...taxpayers deserve a more effective and efficient government than the one we have today," is still true, 14 months into his tenure as mayor. What about that, Mr. Mayor? The sloth of the Emanuel Administration aside, it was a genuine "At last!" moment to see a crew of contractors repaving a four-block stretch of 63rd Street today---from Austin to Narragansett. Photo below---while the repaving crew itself was definitely working at a respectable pace on a hot summer day, the "Slow" sign kind of sums up the pace of the suits in the corner offices at Peoples Gas and City Hall. A repaving crew taking a break with a passing paletero near 63rd and Meade. The spring and summer of 2012 have not been good times for motorists in Clearing and Garfield Ridge. In Clearing, most of 63rd Street has been torn up; and then either left that way or torn up and then filled in with rough-surface concrete---the largest stretch from Central to Narragansett, and a smaller stretch roughly between Sayre and Nottingham. In Garfield Ridge, the westbound lanes of Archer (between Newland and Neva) have long been scarred with a vein of rough-surface concrete. These rough surfaces are equally rough on cars and other vehicles. Tires blow out, shocks get more wear and tear, and alignments get thrown out of whack. Great. Just what we need in the middle of this current economic depression, when money is so tight and people struggle just to put gasoline in the tank. And it's no picnic for pedestrians, either. In May, when 63rd Street was closed entirely at the railroad tracks just east of Harlem, so many motorists drove south through the side streets to get to 65th Street---and so many of them were driving recklessly---that St. Rene School took the drastic step of temporarily disbanding its safety patrol because it could no longer reasonably ensure the safety of patrol members or any other boys and girls walking to school. Much of the tearing up of streets has been caused by Peoples Gas' Accelerated Main Replacement Program, in which Peoples Gas is replacing the outdated cast-iron gas pipes in its natural gas delivery system with modern polyethylene pipes. Peoples Gas says that the Accelerated Main Replacement Program will make it easier for customers to install today's high-efficiency appliances without the extra cost of pressure boosters. By moving the Peoples Gas system from operating on low pressure to the medium pressure, reliability will increase for both current appliances and newer high efficiency equipment, they say. 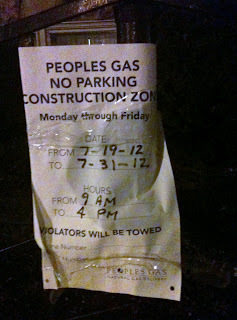 That aside, a gas main replacement/modernization sounds like a very good idea, right? But must their road work be so disruptive and slow? Peoples Gas is spending more than $2.5 billion over the next 20 years in Chicago to modernize and replace more than 2,000 miles of aging pipes and install more than 315,000 meters in order to continue providing a safe and reliable supply of natural gas in Chicago. We realize that construction is not always a welcome sight, and we are sorry for any inconvenience our main replacement work may cause businesses or residents. Where gas mains are being replaced. ** on 63rd Street (westbound from Central to Narragansett), temporary restorations have taken place---as we understand the City of Chicago Water/ Sewer departments are due to start work soon; therefore, final restorations will not take place until their work is completed. ** on Archer Avenue (between Neva and Newland), Peoples Gas main replacement work is completed and temporary restorations have now been put in place with final restoration of the road taking place soon. Some of the street disruption is due to the Chicago Department of Water Management installing 1,349 feet of eight-inch water main on 63rd Street, between Austin and Melvina---replacing a six-inch water main that dates back to 1924. But here's where it gets worse: the Department of Water Management says they won't be finished until late September---and possibly even later than that if the weather does not cooperate. So we may be looking at October. And while Water finished work on the Sayre-Nottingham stretch that it began in March, it has not yet been repaved appropriately. Why not? We put questions to the Emanuel Administration---specifically, the Departments of Water Management and Transportation. We await their answers. And the local reaction to all this? Well, as you might imagine, hundreds (if not thousands) of Clearing and Garfield Ridge residents---as well as people who drive through the area---have been complaining among ourselves and at public meetings. These same complaints and questions have been put to local aldermen, who don't seem to be willing and/or able to get the work accelerated from its maddening snail's pace to something reasonable. Example: At the recent meeting of the Garfield Ridge Neighborhood Watch, 23rd Ward Alderman Michael R. Zalewski spent a total of just nine seconds addressing the issue (granted, he was invited there to talk about graffiti), doing nothing more than acknowledging that people are "a little nuts" over the situation and saying "We're working on it." Example: Thirteenth Ward Alderman Marty Quinn wasn't tight-lipped about the situation at last month's meeting of the Clearing Civic League. In response to several pointed questions from dissatisfied Clearing residents, Quinn said that he has met with Peoples Gas officials several times and that "...the meetings weren't pleasant." "I read them the riot act," he boasted; and regarding the slow pace of gas main replacement and street repair, Quinn said, "I told them 'You wouldn't pull this same stunt in Naperville.'" Interesting assertion. Of course, if it's true, perhaps it's because elected officials in Naperville are more effective than Chicago aldermen who represent 63rd Street. So anyway, what do the rest of us do about it? Well, if you're OK with the rough roads and snail's pace repaving, do nothing. If you're tired of the baloney and think you deserve better, speak up loud and clear. "My name is ( ). I live on the Southwest Side of Chicago. I pay my taxes on time, and I vote. As a good and responsible neighbor, I keep my home and yard in good shape. And I expect the streets in my neighborhood to be kept in good shape, too. Anyone who digs them up needs to put them back into good shape as quickly as possible---not next week, next month or next fall. So with all due respect, I want to know exactly what you plan to do to ensure that 63rd Street, Archer Avenue and any other local streets torn up in 2012 get repaved promptly and completely. I await your response. Thank you." Or customize it and put it in your own words, respectful yet demanding and firm. ...and reach out to Willard S. Evans Jr., president of Peoples Gas. Living up in Skokie, Mr. Evans is miles away from the Southwest Side. But he's a regular joe who grew up on the West Side and is an engineer by training. And he's married to an engineer. So perhaps he hasn't forgotten his roots--and certainly he understands the importance of good roads and being a good neighbor, right? Remember, folks, we get what we put up with.